Charcoal often made from soft maple. Growth: Eastern US. Grows 60-80' ft tall. Uses: Millwork, paneling, cabinets, furniture, doors, mouldings, flooring, butcher blocks, handrails. 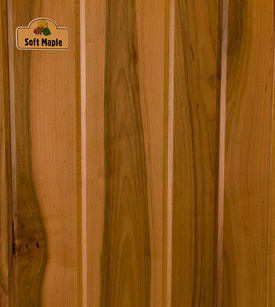 Often used as substitute for hard maple or beech and stained to resemble other species like cherry. Mechanical Properties: 25% less hard than hard maple. Medium bending and shock resistant. Description: Sapwood grayish white with darker color pith flecks and heartwood is reddish brown and straight grain. Working Properties: Machines well. Glues, screws and nails ok.
Finishing: Good for enamel or staining in some brown tones. Accepts both water and oil based products well.